That said, this latest issue is awful. 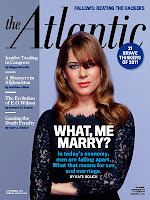 The cover story--cover story!--is about some nearing-40 woman who hasn't gotten married after refusing to settle for her extraordinarily unrealistic standards and, gosh, after plenty of wine dates and brooding in parked cards she's convinced herself that that's OK. The author, Kate Bolik, somehow also manages to get the editors to stuff her mug on the cover and be the only two photos in the article itself. While the sentiment of the article, I suppose, is legitimate, the article itself is full of exactly the sort of self-absorbed, East Coast shallowness that flyover country makes fun of (or actively hates, depending). This would all be forgivable if it were benched in the back of the magazine under "Life" or "Culture"--where they keep the suffering quasi-feminist musings of a collection of "not my fault" columnists--but this, someone decided, was going to be the flagship leader. Apparently, they need to shore up their readership of self-loathing, perpetually unsatisfied shrews. That's not the only editorial blunder in the magazine. There is another feature that presents a collection of "Brave Thinkers." Usually these are pretty good; they often also have a "Big Ideas" feature every so often, along with other similar notions. These are usually pretty good, because they present people and ideas that may not get a lot of attention yet deserve to. However, in the latest issue, along with an assortment of legitimate thinkers, they throw in Steve Jobs and Barack Obama. Really? Given the forum that they were presented, they decided to go with Dude Who Sells Overpriced Toys and Yet Another Politician? (There's nothing outstandingly "brave" when you run an entire country or control a billion-dollar corporation.) They are both certainly successes in their field, but if I wanted to read an article about Jobs or Obama I would read, you know, every other periodical in existence. For a magazine that strives on being remarkably interesting, their missteps in the November Issue place them squarely in the "average" camp. Hopefully this is just an outlier.